We haven't been posting a lot of wheat free recipes lately, but in real life we have been cooking a lot and have a ton of awesome recipes to share with you. 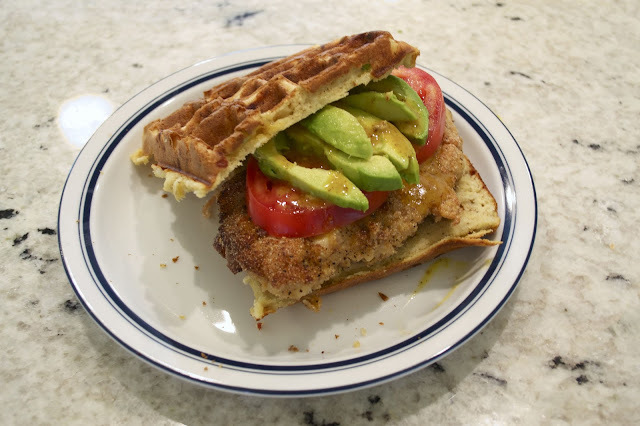 A recent one that has topped our list recently is this Chicken and Waffles recipe from The Candid Appetite. The recipe on the site isn't wheat free but with a few tweaks I made a wheat free version that is AMAZING and addictive. I had never tried to make (or eat) savory waffles before and I honestly wasn't too sure about it, but I clearly had no idea what I was missing! Here are the things I tweaked with this recipe. First, the recipe on the site makes a lot. They use a full waffle for the bottom and top of the sandwich which I thought was a bit much, so used one waffle per sandwich instead. If you do this then a half recipe will make four sandwiches. In terms of making it wheat free it's pretty easy. I substituted gluten free all purpose flour for the regular flour (1 to 1) in the waffle recipe and I used corn meal instead of flour (1 to 1) for the chicken. I actually prefer corn meal over flour when making crispy chicken so I would have done that regardless of the wheat issue. That was it! Super easy changes to enjoy a pretty amazing sandwich. If you want the full recipe, click on over and scroll all the way down (don't worry, you'll eventually get there). And don't miss out on the sauce! It really makes the sandwich.